Did you know that a Day & Night® Ion™ System Control has more energy management features than most thermostats? It's true! The Energy Tracking feature in the video above is just one way the Ion System Control can put customers in command of their energy costs. Let's look at how the Day & Night Ion System Control can help customers take control of energy costs in more detail. The Ion System Control provides two-way communication between home comfort system components (i.e., an Ion System Control and Day & Night modulating furnace, air conditioner or heat pump). This two-way communication allows for optimal Day & Night system performance and helps maximize efficiency while minimizing operating costs. When properly equipped, the Ion System Control efficiently manages temperature and humidity control, helping save energy and reduce monthly utility costs for customers. Smart Setback/Recovery technology can also help homeowners curb energy costs. This unique technology starts the home comfort system before a scheduled temperature change, conserving energy by gradually raising or lowering the temperature in the home. So, the Smart Setback/Recovery function ensures that the house reaches the selected temperature at the proper time without using excess energy. Pretty smart! The Ion System Control is completely programmable. Homeowners can set customized comfort schedules to maximize savings while away from home for work or vacations. They can even extend those settings with mobile access. No more guessing about the next utility bill. With the Ion System Control and its Energy Tracking function, homeowners can view electrical or heating fuel usage in units or dollars spent. As demonstrated in the video above, the Energy Tracking feature is a great tool for managing costs. It lets customers make informed decisions about their comfort settings and energy usage. 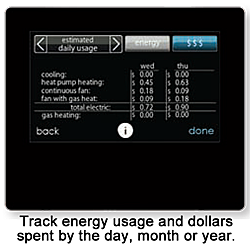 The Ion System Control is much more than a programmable thermostat. It has several energy management capabilities that put customers in control of their comfort and energy usage. With its two-way communication feature, the Ion System Control can maximize efficiency of the complete Day & Night home comfort system. And, the Smart Setback/Recovery technology, vacation energy savings and real-time energy functions allow homeowners to balance comfort control and energy savings.